An extremely common misconception is that because ketogenic diets are high in fat, they must increase cholesterol in your body and clog your arteries. However, recent research seems to prove this theory wrong. In fact, low-carb diets can optimize your cholesterol levels and in fact improve your heart health. 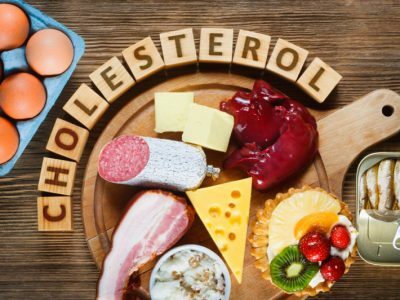 It's also important to keep in mind that cholesterol is vital when it comes to making sure our bodies function properly. So how does keto impact cholesterol? What are some common misconceptions about the role of cholesterol in our bodies? Cholesterol is extremely important, and it has a variety of functions. Some of these functions include building hormones like estrogen and testosterone, maintaining the integrity of cell membranes, and aiding in the absorption of vitamins. Another important thing to take note of is that a majority of your cholesterol is actually produced inside your body. Typically, 75% of the body’s cholesterol is produced internally while the other 25% is ingested from external sources. While these lipoproteins are often referred to as cholesterol, that's actually a misconception. You see, these molecules themselves are not cholesterol; they are cholesterol transporters. LDL and HDL are frequently used as clinical indicators. However, it's important to note that there really isn't "good" or "bad" cholesterol. HDL helps transport cholesterol around the body and collects cholesterol that is not being used by cells. Basically, HDL prevents cholesterol from accumulating and clogging arteries. The keto diet has some pretty substantial effects on cholesterol levels. Specifically, on HDL cholesterol. HDL cholesterol plays a crucial part in preventing clogged arteries and promoting optimal cardiovascular health. However, a majority of Americans do not have HDL cholesterol levels high enough to decrease the risk of cardiovascular illness. So how exactly do you raise your HDL cholesterol levels? Well, one way to do this is through a low carb diet like keto. In fact, a low-carb diet (<50g carb) is an effective method in raising HDL cholesterol when compared to traditional weight-loss diets that emphasize reducing fat intake. So if you need to increase your HDL levels, a ketogenic diet could be the perfect option for you. So now that we have a better understanding of the effect that the keto diet has on cholesterol, let's talk about the importance of fatty acids. While fats are often seen in a negative light, they are actually extremely important. In fact, a high-fat diet actually optimizes cholesterol levels. In other words, when you restrict carbohydrates and get a majority of your calories from animal fats, coconut oil, and unsaturated fats like fish, nuts, avocado, and olive oil, it is highly likely that you will improve your cholesterol levels. And the perfect way to implement all these foods into your diet is by following the ketogenic diet! In short, the keto diet helps optimize your cholesterol levels and reduce your risk for heart disease. If you are looking for a diet that optimizes your cholesterol, the keto diet could be a great option for you. Want to learn more about the benefits of the Keto lifestyle? Then I encourage you to grab your Free Keto Quick Start Guide Today! My main goal is to take your personal health on a transformative journey from a place of lethargy and carb addiction to that of euphoria and fat-burning. My experience, training, and passion are all about educating and empowering women to get results; not just in terms of fat loss, but in improving their overall quality of life, and the lives of those around them. It is my pleasure to serve you and help you find a happy and healthy lifestyle with Ketogenic Living, so let's connect!